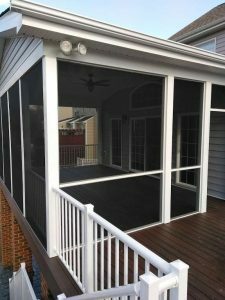 Relax or entertain with your new screened porch or deck. Either choice provides an outdoor area to host company, serve meals or to relax and enjoy your backyard. Decks can be multi-level structures or a simple landing area by your backdoor. A roof structure or pergola over a new or existing deck is a valuable addition, providing protection against sun, rain, and insects. A roof structure doesn’t have to cover the entire deck. If your deck is large, consider covering only one portion and leaving the remainder uncovered. A partially covered deck gives you the option to enjoy the sun on a beautiful day or lounge in the shade when the sun is too hot. Add a grill to either area and you have a great outdoor entertaining space. The photo above shows a complete outdoor entertaining area. The second story includes a screened porch and a deck area perfect for grilling. At ground level the homeowners have a stamped concrete patio, basketball pad and a stone seating wall surrounding the fire pit. We used low maintenance vinyl railing and composite decking. To the right you see a screened room which allows you to make the most of your outdoor space, since you won’t have to worry about being pestered by insects, or harmful UV rays. Plus, of course, you’ll have a shaded space where you can enjoy your yard all year long, even during the hot summer months. Porches can also be completely enclosed. This will add living space to your home and allow you to enjoy your outdoor space year round. Above is an example of a pressure treated deck with lattice underneath. This area could be used for storage, if needed. There are many choices in decking materials today. The most common are pressure treated lumber, natural woods, and composites. If you are interested in a green solution, composite materials offer environmentally friendly options made from recycled plastics and wood fibers. 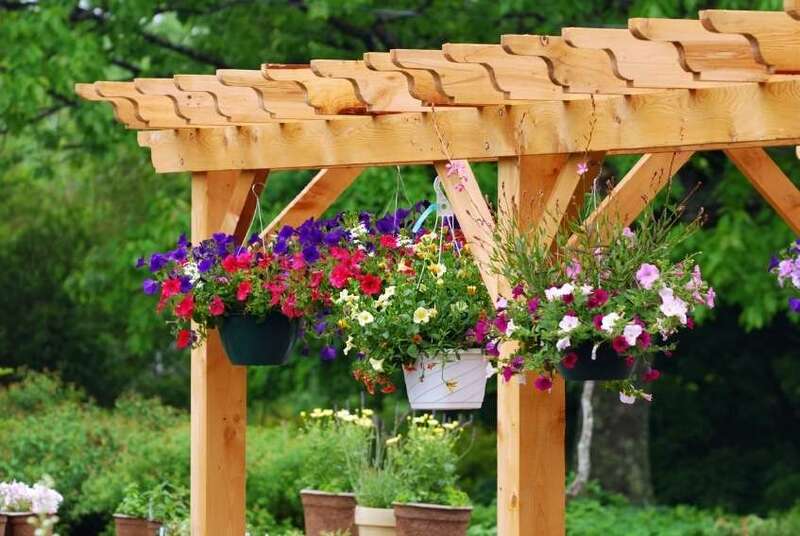 Pergolas and Arbors are simple additions that can really have a big impact. They can be placed over patios or decks to provide some shade. Vines and creepers can be planted for a pop of color or to compliment lush gardens. Historically, porches are designed to protect the entrance to your home from the weather. Before central air conditioning was common, the porch evolved into a place where you could escape the heat and enjoy the cool evenings. The outdoor air provided a cool alternative to the stuffy indoor temperatures. The entire family would move to the front porch to tell stories, play music and sing songs. In the above photo, you will see a modern front porch featuring bright white columns and black aluminum railing. Below is a historical porch that was rebuilt meeting the guidelines set by the Virginia Historical Society. We were able to use vinyl, composite and PVC material to reduce the need for costly and laborious maintenance. In addition to decks and screened porches, we provide other home services including kitchen remodeling, bathroom remodeling, additions and mother-in-law suites, whole house remodeling, siding, doors and windows too. If you would like a quote, contact us today! Over the past 2 years, Aaron has done 3 major jobs for me (walled in one room for a home office, enlarged my deck, and installed hardwood flooring). I am 100% satisfied with his work. Excellent work, excellent customer service. Not only was the work done quickly, the job was easy to manage from a distance.